In Coraline's dreams, she awakens to a white mouse urging her to follow (not unlike the rabbit in Alice In Wonderland). She follows the mouse and finds that the brick wall behind the door is no more, and a glowing rectal passageway urges her forward. At the other end of the colonoscopy, Coraline finds herself in an alternative reality. In this reality, her mother and father have become the parents she had been begging them to be at the beginning of the movie. Parents who would spin their every movement and action so that they could gravitate around Coroline's narcissism. 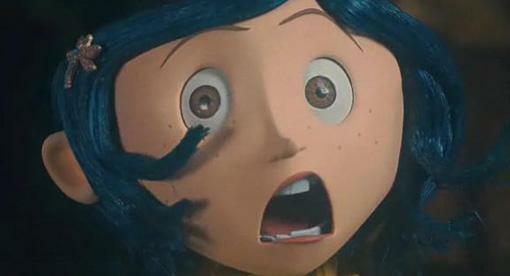 There is a very quick scene where nearing the end of dinner in the alternative reality, she notices that the other-mother's fingers are tapping impatiently while waiting on Coraline's response. Taking this as a cue, she becomes nervous and makes her way to bed. The next morning she wakes up into the really-existing-reality and checks the door to find the brick wall is still there. So, what is up with the reality flip flopping? 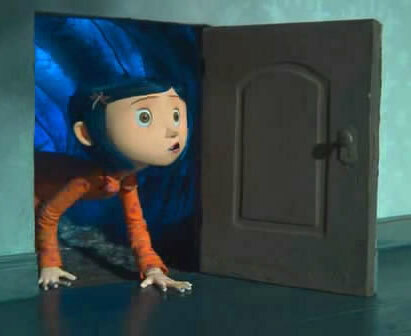 Lets saw into Coraline's reality sliding from the angle of dream analysis. What is the nature of the wish Coraline is fulfilling by dreaming parents who give into her narcissism? Skimming the surface this may look like Coraline is imbuing the other-parents with the qualities she wished her real parents had. 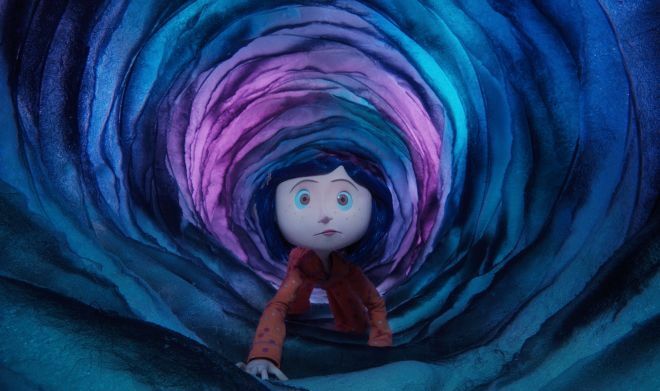 But, Coraline's set of dreams are not so simple. Even in the first dream, the other-mother's impatiently tapping hand reveals a lay of superficiality in the attention that the other-mother is dishing out. Quickly, Coraline catches on to the other-mothers game. She is trying to trap Caroline in the other-word, in order to satisfy her own compulsion for attention. Who is this dream's wish for? Stepping back, let's consider the totality of the film Coraline in the context of societal dream work. In who's interest is wish presented in the film Coraline? Lets saw into the wish. 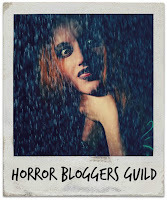 The film portrays a little blue hard girl who follows her parents to live in a bland tri-plex with a set of eccentrics. Surrounding the home is desolate muddy landscape devoid of colors. In the home, the walls and floor echo the drabness of poverty and poor upkeep. When tasked by her father to count the windows and explore the house, she pulls back the shower current to find a swarm of bugs which she squishes with her hands. This home is not where the rich. Coraline's set of dreams present a vibrant vision of a happy and caring parents who take the time away from the their work schedule to play with their daughter. The vision is exactly the vibrant and stimulating existence that a little girl needs to develop into a healthy member of society. Yet, beneath the surface of the fantasy there are corrupt alternative motives. The ideological underbelly of the film appears to be, “be satisfied with your abjection and poverty.” The evidence for this is the clash between the parents wish and the coastline’s wish. The parents want children who can get out of their hair while they are working overtime, and Coraline wants a minimal of parenting. These two wishes savagely confront each other when the other-world takes Coraline's real parents hostage, and she has to confront and erratic her original wishes in order to recover her parents. The film ends in a moment of overlap where the real parents have finally set their work aside in order to conform to Coraline's original demands- to go outside and garden. What has changed? Coraline has learned a sharp lesson to be careful what she wishes for and the parents get off with immunity, they are still the same emotionally neglectful parents from the beginning of the movie.